I’ve got a riddle for you. When is a pound cake not a pound cake? When it’s a pound cake (I’ll explain later, I promise). A few days ago I had my third and final session as one of the judges for the specialty cooking contests of the 2016 state fair. I was really looking forward to it, because the category was pecans. The pecan, or Carya illinoinensis, is actually a variety of the hickory. The trees, which can grow up to 144 feet tall, are native to Mexico, and from the Gulf coast of Texas up to Illinois. It is one of the most recently domesticated crops. Until the 1880’s it was solely harvested from the wild. And although they have been enjoyed since well before the Europeans showed up, people can still not agree on whether they are “pee-cans”, or “pick-kahns”. But regardless the pronunciation, these nuts are absolutely delicious, and work well with both savory foods and sweets . As much as I love pie and pralines, my favorite preparation is salt & pepper pecans; merely generously seasoned pecans sautéed in butter. I have to ruthlessly limit my exposure though, because I can devour a pound of them while in a pecan-induced fugue state. Then I regain consciousness into a pecan-induced shame spiral. The contest last week, in addition to being a heck of a lot of fun, included a notable first in my role of cooking judge. Heck, it was a first in my entire existence as a human. It was cake that was too sweet. I’ve never even understood the term “too sweet” before. I’m the girl who considers frosting a food group. I always thought it was a phrase made-up by light weights that couldn’t hold their sugar. But the phenomenon exists. It felt like biting into tin foil with a mouth full of fillings. My mouth recoiled from the sensation. It coated my tongue and made my teeth hurt. Happily, there was another cake which wasn’t too sweet, but just right. It took third place; a pound cake from Chapel Hill’s Cherie Michaud. Preheat oven to 350 degrees. Combine 2 eggs, vanilla, milk, oil and butter in mixer. Begin mixing on low to medium speed. Once blended together, add the last 2 eggs. In another bowl, combine sugar, flour, baking powder and salt. Sift the dry ingredients into the egg/milk mixture. Mix until combined, about 30 seconds. Place pecans into a food processor and pulse for 30 seconds. Add pecans into the cake mixture and combine for 1 minute or until everything is well blended. Spray a Bundt pan with cooking spray and sprinkle with sugar to coat. Pour cake batter into pan and tap on counter to remove air bubbles. Bake for 50 minutes or until golden brown. Remove from oven and let cool in pan 30 minutes. Remove from pan and let cool completely. Combine butter, milk and vanilla with a mixer. Once combined, add the powdered sugar, cinnamon, nutmeg and salt. Mix on low-medium speed for 1-2 minutes. 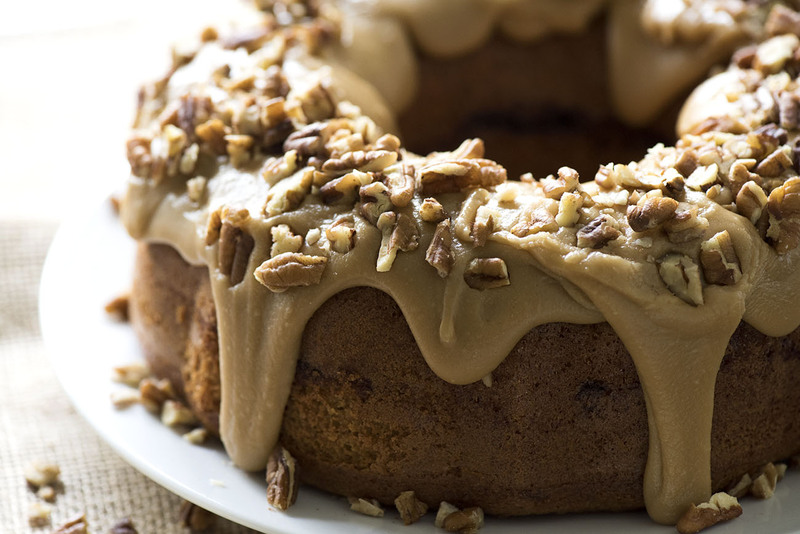 Spread frosting over cake and top with pecans. So, about the pound cake riddle. Traditional cakes have one pound each of flour, sugar, butter, and eggs, with no leavening (baking powder or baking soda). It gets it rise from air whipped into the batter, and starting in a cold oven. A modern pound cake uses leavening. This reduces the possibility of failure, but purists feel it’s the cheater’s way, and an affront to all decent pound cakes. Imagine Martin Luther with a Bundt pan and a manifesto. A confectionary Luddite, if you will. Thanks for your time.